First kisses are always nerve-racking—but especially when they’re onstage! Can Grace find a real-life Prince Charming before she has to lock lips in front of a crowd? When Grace Shaw finds out she’s been cast as the lead in her school play, she has about two seconds to celebrate before she realizes she’ll have to kiss Prince Charming, aka James Lowe, aka the heartthrob of Sloane Middle School…on the lips! She’s never kissed a boy, and the idea of experiencing her very first kiss in front of a live audience with the most popular boy in school sounds like her worst nightmare instead of a dream come true. 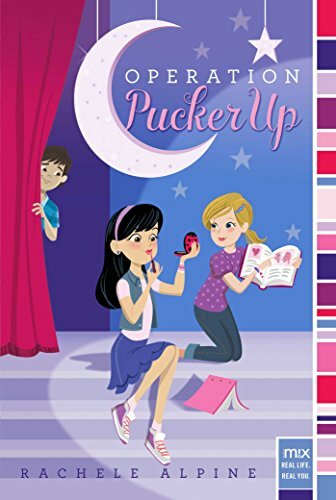 So Grace’s two best friends propose Operation Pucker Up—a plan for Grace to score a kiss before opening night so she doesn’t make a fool of herself in front of an audience. And as if Grace isn’t having a hard enough time, her estranged father suddenly reappears after leaving six months earlier. Her mom and sister welcome Dad back with open arms, but Grace can’t simply forgive and forget. With opening night fast approaching, Operation Pucker Up reaching ridiculous levels, and family drama teeming behind the scenes, Grace is beginning to think all this love stuff is way too complicated. Will she find a way to have her happily ever after—and seal it with a kiss—both onstage and off?